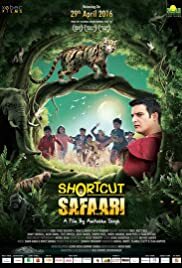 Shortcut Safari revolves around a group of urban Children who get stuck in dense forest- far away from their homes and families. Seven of them, all different and quirky. That too, for three days, completely on their own. To top it, they have a chance encounter with two poachers who are roaming the forest in hunt of a rare, clouded leopard Jimmy. The kids manage to subdue the poachers, but that leads to a bigger confusion- who is the real Jimmy? Lets meet him in this engaging story of exploration and adventure through the eyes of these children. Who, in return, gain values on mutual respect, team-spirit and perseverance on one hand; and the vital relevance of a sustainable environment with a balanced wild-life on the other.